In this tutorial the Stellaris LM3S6965 Evaluation board will be used to demonstrate a simple PWM (Pulse Width Modulated) example. This is part of a larger project I am working on, which is not covered in this tutorial but will be posted at a later date. The first thing that needs to be setup with the Stellaris is the system clock, the following code below uses the external crystal oscillating at 8MHz. Next the PWM peripheral needs to be enabled, there are 3 PWM modules on the LM3S6965 evaluation board. For this example PWM0 will be used, which is located on GPIO port F.
The next step is assign a pin type to the GPIO, there is a specific function to configure a pin or pins for use by the PWM peripheral. PWM0 and GPIO pin 0 on port F is assigned, this combination was used for the PWM as it allows the onboard status LED to be controlled by varying the brightness, and will also allow a meter to be used to measure the frequency from the PWM. 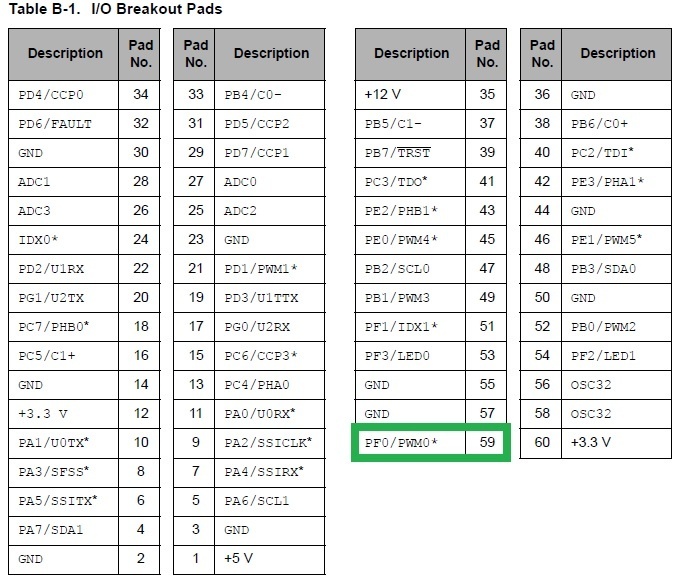 The image below and left shows the I/O Break Pads, the image on the right the on board peripheral signals, both are extracts from the LM3S6965 evaluation board user guide. After the GPIO is setup the PWM can now be configured. As stated before there are 3 PWM modules on this particular microprocessor, only 1 is being used in this example PWM0. Each PWM generator module has a 16 bit counter, 2 PWM comparators, a PWM signal generator, a dead-band generator and an interrupt/ADC-trigger selector. This program example will just produce a simple output using the up down counter. PWMGenConfigure() is used to set the mode of operation for the PWM generator. The counting mode, syncronization mode, and debug behaviour are all configured. Once configured the generator is in a disabled state. A code snippet of this function is shown below. // of \b PWM_GEN_0, \b PWM_GEN_1, \b PWM_GEN_2. PWMGenPeriodSet() is used to set the period of the PWM generator. Note the comment regarding the placement of this function with regards to PWMGenConfigure(). // one of \b PWM_GEN_0, \b PWM_GEN_1, \b PWM_GEN_2. PWMPulseWidthSet() is used to set the width of the pulse for the specified PWM ouput. Note the comment regarding the placement of this function with regards to PWMGenConfigure(). // Sets the pulse width for the specified PWM output. // \param ulBase is the base address of the PWM module. // \param ulWidth specifies the width of the positive portion of the pulse. 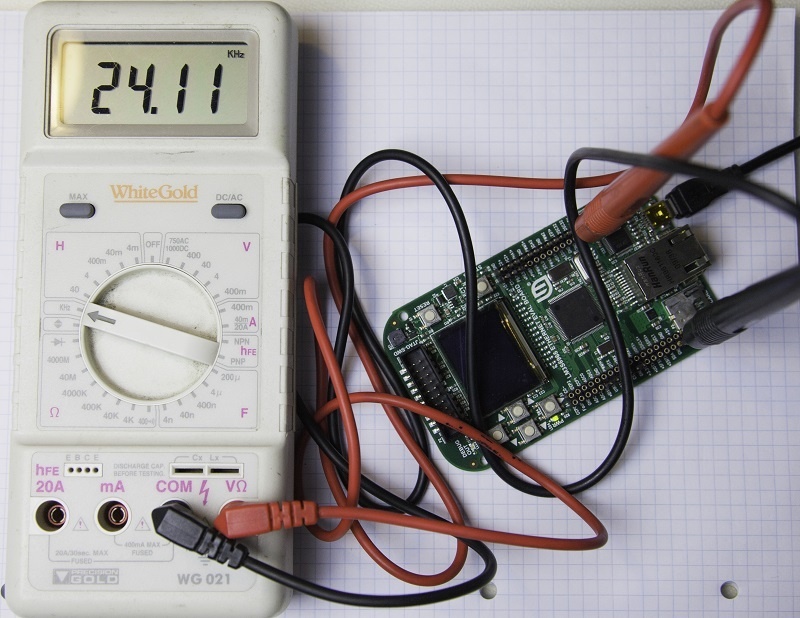 PWMGenEnable() is used to enable the timer/counter of the PWM generator. // Enables the timer/counter for a PWM generator block. PWMOutputState() enables or disables the PWM outputs. // Enables or disables PWM outputs. // \b PWM_OUT_2_BIT, \b PWM_OUT_3_BIT, \b PWM_OUT_4_BIT, \b PWM_OUT_5_BIT. // \param bEnable determines if the signal is enabled or disabled. // or placed in the inactive state. 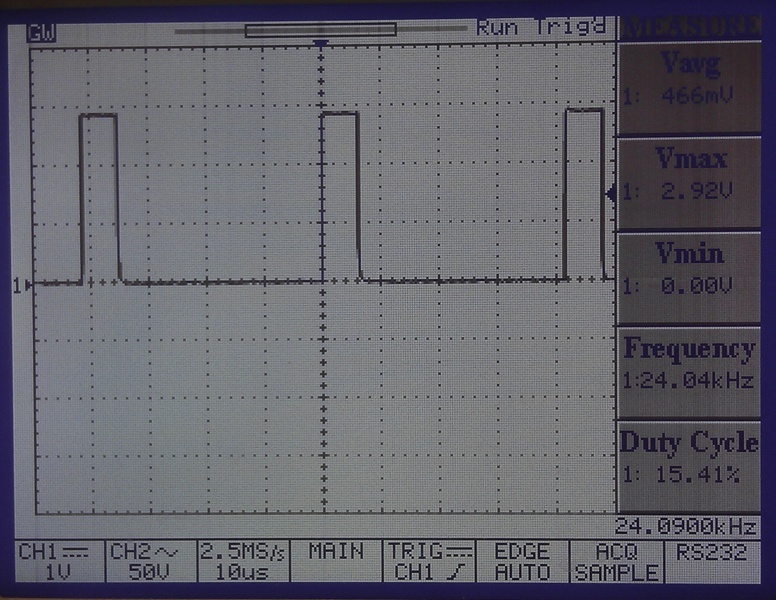 In this example a frequency of approximately 24kHz was generated, with approximately a 50% duty cycle. 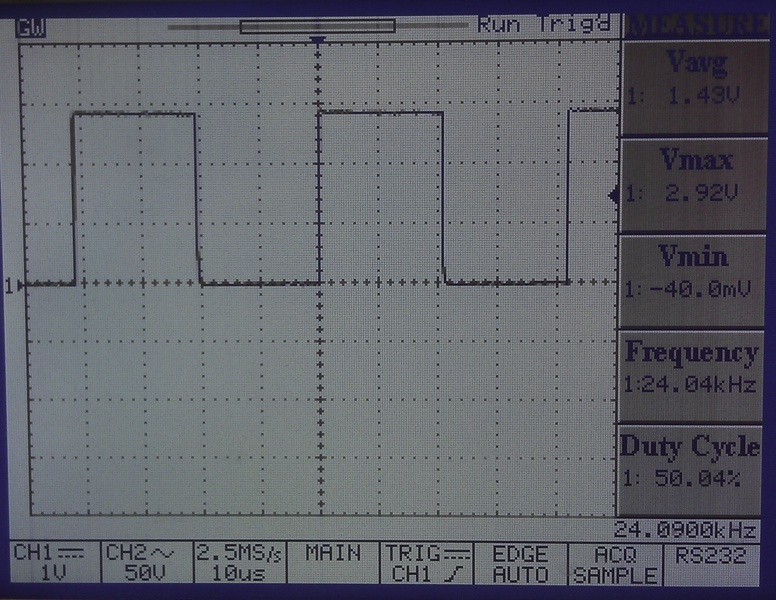 The image below shows a basic multimeter with a frequency counter, displaying a value which coincided with the example program, and 2 further images showing Oscilloscope traces with the PWM duty cycle at 50% and 15%. Hi, I am doing the same thing but with the port D and de PWM1. I don’t know why my code don’t work. PWM1 will still be controlled by PWM Generator 0. Are you able to produce a PWM output on Port F as in the example code?